As this week takes many Dwell staff members to Milan for the 2014 Salone Internazionale del Mobile, we know that wherever they are headed, travelers have certain universal needs. These seven essentials from the Dwell Store aim to meet those needs and ease your trip from here to there to anywhere. This heavyweight canvas duffel bag designed by Emily Sugihara for Baggu is a casual way to keep your essentials safe and secure. 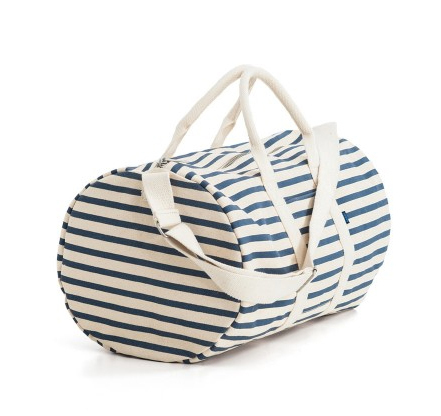 Suitable for weekend getaways and overhead bins, the Baggu Duffel Bag will quickly become your go-to travel bag. After a long hiatus, the Braun Travel Clock is back in black. With an alarm, a torch light, and a world time zone map, the travel clock will help you keep track of time wherever you are. The Hofdi Lambswool Children's Blanket, designed by Donna Wilson and intended for babies and toddlers, is knitted in soft lambswool for perfect snuggling conditions. Featuring a colorful pattern, the eye-catching blanket is sweet enough for little ones to love and stylish enough for design-conscious parents to appreciate. With its soft texture and engaging design, the Hofdi Blanket is sure to become a treasured “blankie” for young children. In chic black aluminum and nylon, the Hook City Umbrella is light, durable, and fit to withstand a strong wind. Whatever the forecast and wherever you're going, this umbrella is guaranteed to suit the local climate. New York apothecary Malin + Goetz has gathered together cosmetic essentials that will keep you fresh and clean through long stays away from home. Their 1 oz. Carry-On Approved Essentials Kit includes face and body cleansers and moisturizers. The WOW Bluetooth Speaker by Antonio Arévalo for Kakkoii is USB chargeable and requires no batteries. The speaker connects wirelessly to any compatible Bluetooth device within a 33-foot radius, and its auto-play feature pauses the music when there is an incoming call, seamlessly integrating work and play.